miniOrange provides a ready to use solution for MangoApps. This solution ensures that you are ready to roll out secure access to MangoApps to your employees within minutes. MangoApps is a platform for employees which contains applications like Intranet, workspaces, file sharing, networking, recognition, training and more into one easy-to-use portal. miniOrange provides secure access to MangoApps for enterprises and full control over access to the application. 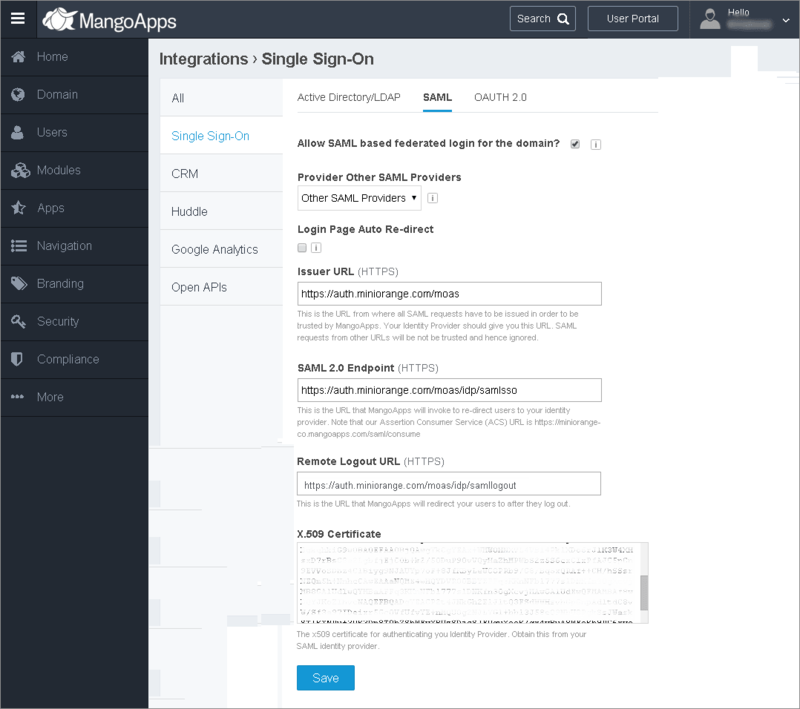 Single Sign-On (SSO) into MangoApps with one set of login credentials. The Enduser will be redirected to their MangoApps account by clicking the MangoApps icon on the Enduser Dashboard - there is no need to log in again. 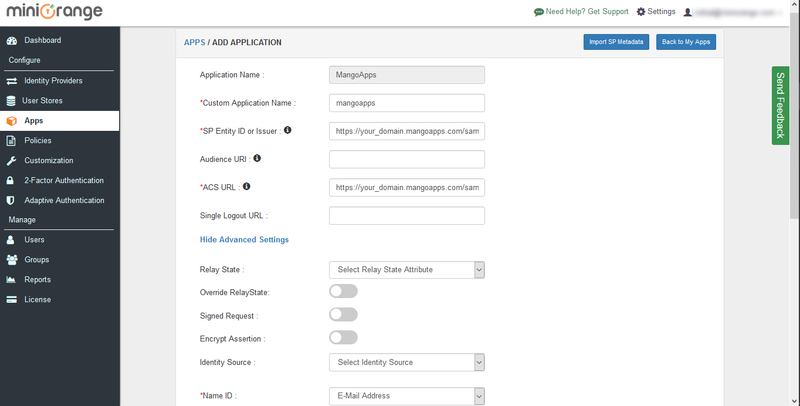 In SP Initiated Login, SAML request is initiated by MangoApps. An Enduser tries to access their MangoApps account. Here they can enter the miniOrange login credentials and login to their MangoApps Account. Click on SAML tab. Select MangoApps. Enter the SP Entity ID as https://your_domain.mangoapps.com/saml/consume. You can set another value for relay state depending on where you want to redirect the user after SSO. Add a new policy for MangoApps. Select a Group Name from the dropdown - the group for which you want to add MangoApps policy. 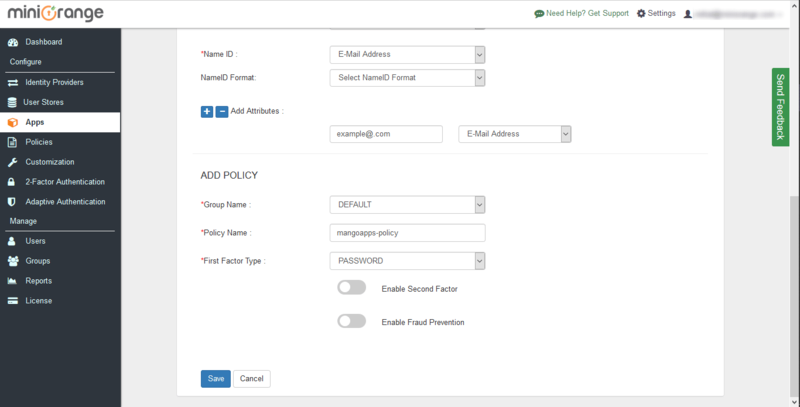 Give a policy name for MangoApps in the Policy Name field. Click on Save to configure MangoApps. Click on Metadata link to download the metadata which will be required later. Click on Link to see the IDP initiated SSO link for MangoApps. Keep IdP Entity ID, SAML Login URL, SAML Logout URL and copy X.509 Certificate which you be required in Step 2. Login to your MangoApps account as the Account Administrator. Then click on Integration tab on the left. Go to Single Sign On, select the SAML tab. Check the Allow SAML based federated login for the domain? option. Issuer URL Enter IdP Entity URL that you got from Step 1. SAML 2.0 Endpoint Enter SAML Login URL that you got from Step 1. Remote Logout URL Enter SAML Logout URL that you got from Step 1. X.509 Certificate Paste the X.509 Certificate that you copied in Step 1. 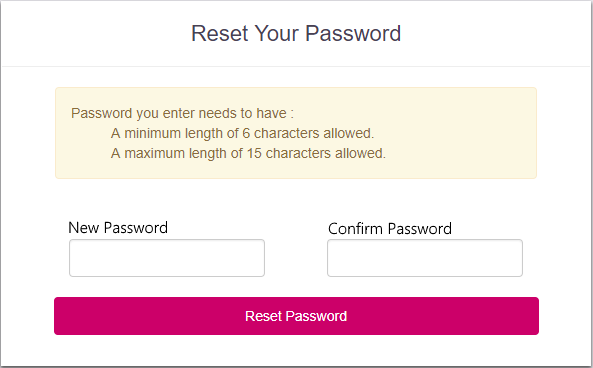 Check the Login Page Auto Re-direct option. Click Save to save the Single Sign On (SSO) SAML settings. Click on MangoApps application which you added, to verify your sso configuration.